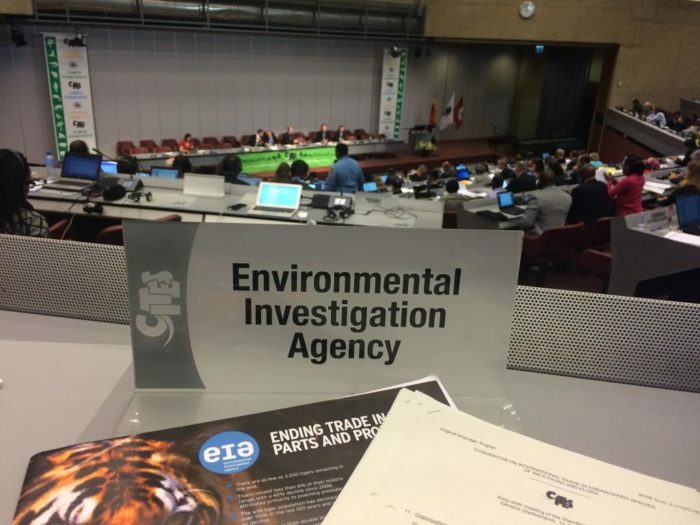 Last week, EIA campaigners participated in an important meeting of the Standing Committee of the UN Convention on International Trade in Endangered Species (CITES) in Geneva and addressed a range of issues involving wildlife and timber trade. The Standing Committee is a vital body under CITES that provides policy guidance concerning the implementation of CITES decisions and submits proposals for consideration by the Conference of the Parties (CoP) which takes place every 2-3 years and marks the meeting of all 181 Parties. With the 17th CITES CoP (CoP17) in September this year, the Standing Committee meeting was crucial in flagging key issues for its attention and for potentially shaping the course of action for the implementation of CITES. Going into the meeting, EIA had an ambitious list of ‘asks’ and we are pleased to note that we achieved some success, although we do have a lot of work cut out for us in the run up to CoP17! As a member of the CITES Asian Big Cat Working Group chaired by China, EIA had witnessed several months of dead-end negotiations with China blocking progress on ending trade in the parts and products of captive tigers. EIA was deeply concerned that we would fail to achieve meaningful outcomes for Asian big cats but, having participated in lengthy deliberations and in building strong alliances to oppose trade in Asian big cat specimens last week, EIA is pleased to note that the Standing Committee adopted a strong process for tackling such trade. EIA commends the UK, US, India and several other stakeholders who tirelessly participated in the Working Group deliberations for making these outcomes possible. 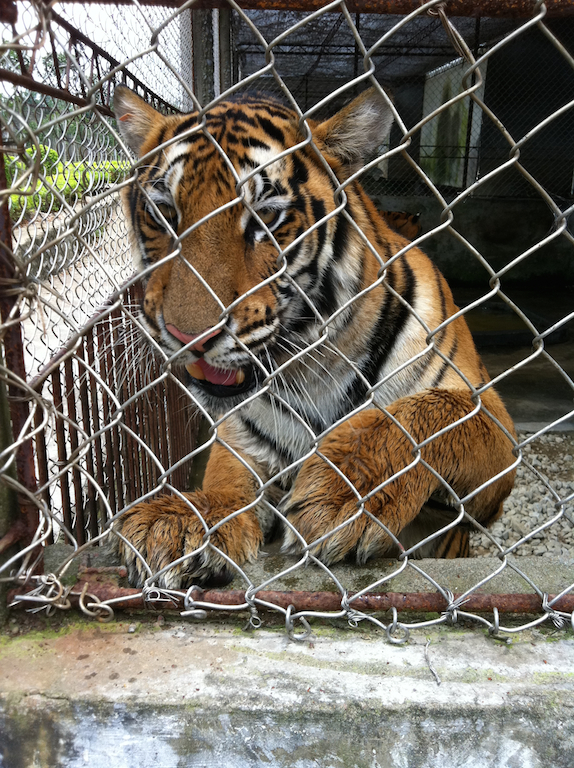 A decision has been proposed for CoP17 which would direct the CITES Secretariat to work with INTERPOL and other intergovernmental organisations to review legal and illegal trade from or through Asian big cat captive facilities, identifying those which may be of concern and possibly undertaking a mission to visit such facilities to collect information about their operations and activities. Significantly, this decision empowers the Standing Committee to identify “time-bound, country-specific actions” to address the issue of the escalating trade in Asian big cat captive specimens. Many other important decisions on Asian big cats were adopted last week and are available here. Despite these positive outcomes, EIA is disappointed that we are still a long way from achieving solid action on the ground to close down tiger farms and end all demand and trade in tiger parts and products. EIA’s range state partner organisation, the Wildlife Protection Society of India (WPSI), delivered a strong intervention on behalf of nine other organisations, including EIA, urging CITES Parties to take more urgent action to tackle the precipitous decline of tigers and other Asian big cats in some range states. Immediately following the meeting, EIA and 17 other NGOs issued a joint statement acknowledging the positive outcomes at CITES but calling for more urgent action to end tiger ‘farming’. EIA has long opposed the ongoing discussion of the ‘Decision-making mechanism for a process of trade in ivory’ (DMM) which would facilitate a future legal trade in ivory. It was gratifying to see last week the 28 member states of the EU announce their opposition to the DMM, marking a landmark change in policy of the EU on this issue. Joining the EU in opposing the DMM were a long list of countries, including the USA, Israel, Kenya, DRC, Uganda, Ethiopia, India and several other elephant range states. In support of this position, the Wildlife Conservation Society (WCS) intervened on behalf of EIA and 10 other NGOs to jointly call for suspension of the DMM. EIA is pleased to note that the Standing Committee suspended discussion of the DMM until CoP17, leaving it to the CoP to decide whether the DMM discussion “should or should not be extended”. In addition, thanks to the commendable efforts of the EU which came to SC66 with a strong position on tackling ivory trade, the Standing Committee adopted a decision urging Tanzania to report on any prosecutions of offenders involved in the poaching of elephants and/or ivory trafficking, any forensic samples collected from ivory seizures and on the adoption of appropriate legislation in Zanzibar. 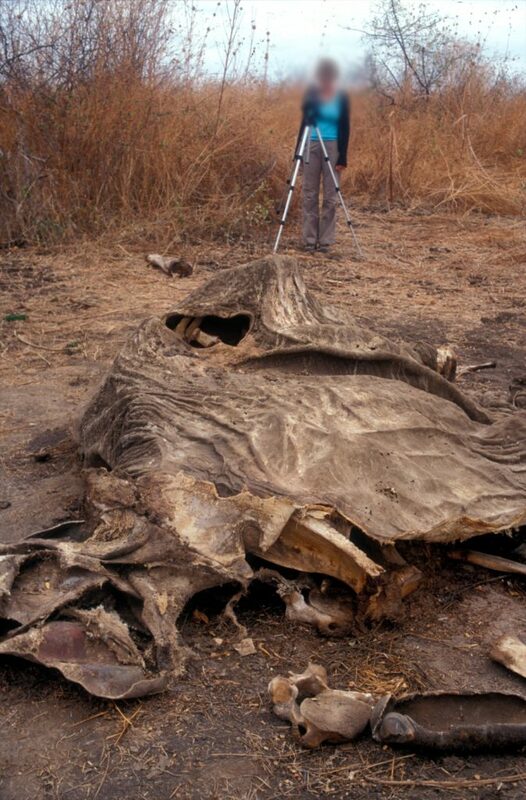 EIA is pleased with this outcome, particularly because we have repeatedly flagged the failure of Tanzania to conduct forensic analysis and other enforcement action following ivory seizures implicating Tanzania. In addition, Nigeria, Angola and Laos were slapped with trade sanctions until such time as they submit information to demonstrate progress in combating poaching and illegal ivory trade. EIA hosted a successful side-event where we screened a rough cut of a new film designed to assist enforcement agencies to tackle elephant poaching and the illegal ivory trade. We thank all the stakeholders who participated in the event and for providing valuable feedback. 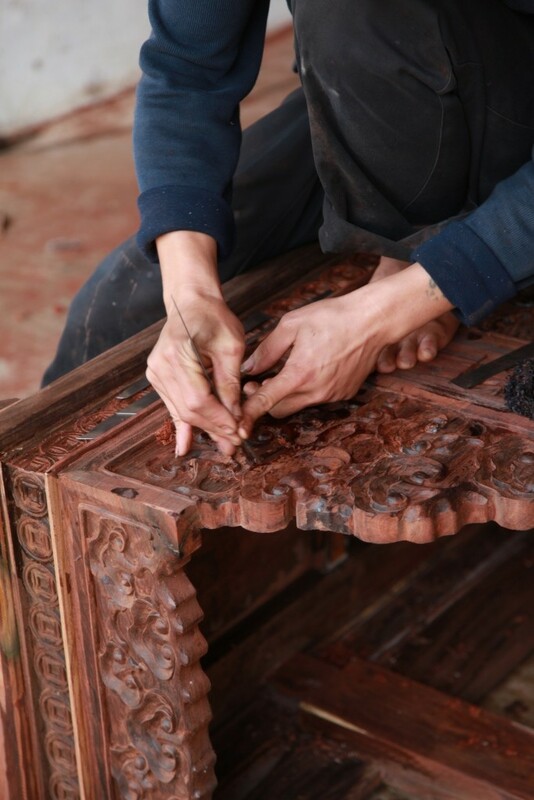 The Standing Committee posed an opportunity for EIA’s Forests campaigners to hold an event launching a new briefing on the lucrative Chinese Hongmu furniture industry. Mapping the growing trend in desirable tropical timber species sourced from around the world, the briefing called for additional listings for unrestricted species and up-listings to existing CITES listings to strengthen global protection for increasingly sourced species. Madagascar was in the hot-seat with the recurrent agenda item on Malagasy rosewoods, banned from international trade with a zero-export quota since 2013. The Committee supported the Secretariat’s recommendations to extend the timber ban until September and Madagascar could face CITES sanctions across trade in all CITES species if sufficient progress under the agreed Action Plan is not reported by the deadline. The delegates from the Democratic Republic of Congo were asked to account for over-harvesting of stocks of Pericopsis elata (African teak). Despite some initial confusion on the current quotas, permission was granted to export existing logged stocks under the 2016 quota, noting that there would be no room to increase the quota retrospectively. The Committee was encouraged by DRC’s efforts to manage timber harvests and stockpiles with a new database yet cautioned the DRC that the utility of the database needs to be properly implemented so as to not incur the same problem in the future. The issue of illegal trade in totoaba was discussed and it was highlighted that China, Mexico and the USA needed to work together for there to be any success to improve the status of the species. Promisingly, these three member states have already started cooperating. 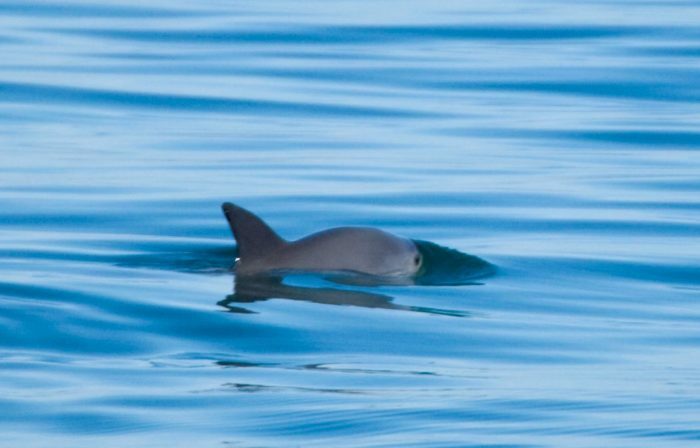 Following the launch of EIA’s new report on the illegal totoaba trade which is also driving the vaquita porpoise to extinction, we hope that this momentum continues and the information provided in our report facilitates future enforcement action. The Standing Committee adopted a decision directing the CITES Secretariat to undertake a mission to Laos to assess its failure to implement CITES and to make recommendations for further actions. EIA welcomes the mission and is keen to see this process lead to a close examination of the poor governance and lack of capacity in Laos that have resulted in the country becoming a haven for trade in tigers, ivory, pangolins and illegal timber. In addition, EIA is a member of the Working Group on Special Reporting Requirement and contributed towards preparing a comprehensive report on identifying gaps in existing CITES mechanisms for studying illegal trade in CITES species and preparing recommendation to address these gaps. EIA is pleased to note that after deliberations last week, the Standing Committee adopted a recommendation that there should be annual mandatory reporting on illegal trade in all CITES species, including on seizures, arrests and prosecutions. Since February 2006, EIA has been actively advocating for CITES to propose a set of ‘enforcement indicators’. We are pleased to note that last week a comprehensive set of such indicators were shared with the CITES Standing Committee, produced by the CITES Secretariat on behalf of the International Consortium on Combating Wildlife Crime (ICCWC). We commend the CITES Secretariat and ICCWC partners for making available this excellent tool for assessing the impact of enforcement efforts, which we hope the donor community will turn to when evaluating projects to combat illegal wildlife trade. 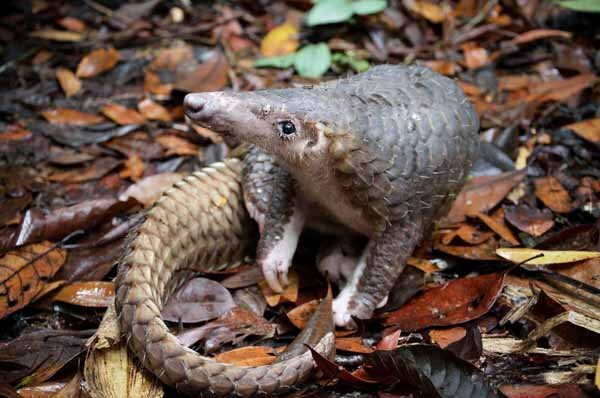 There appears to be strong support for improving the protection for pangolins by listing all pangolin species under CITES Appendix I, including by India, USA and Zimbabwe. In addition, a draft resolution on pangolin trade was adopted by the Standing Committee and proposed for final adopted at CoP17. Sri Lanka and the Maldives announced a proposal to list silky sharks and thresher sharks on CITES Appendix II. However, China and Japan warned against listing any more shark species under CITES. This issue will be decided at CoP17. CoP17 will take place in Johannesburg, South Africa in September and October this year. EIA will be attending to push for for the best possible outcomes towards ending domestic as well as international trade in ivory, tiger and other Asian big cat parts and products and to combat illegal trade in other wildlife and timber species. Watch this space for more updates in the run up to CoP17.